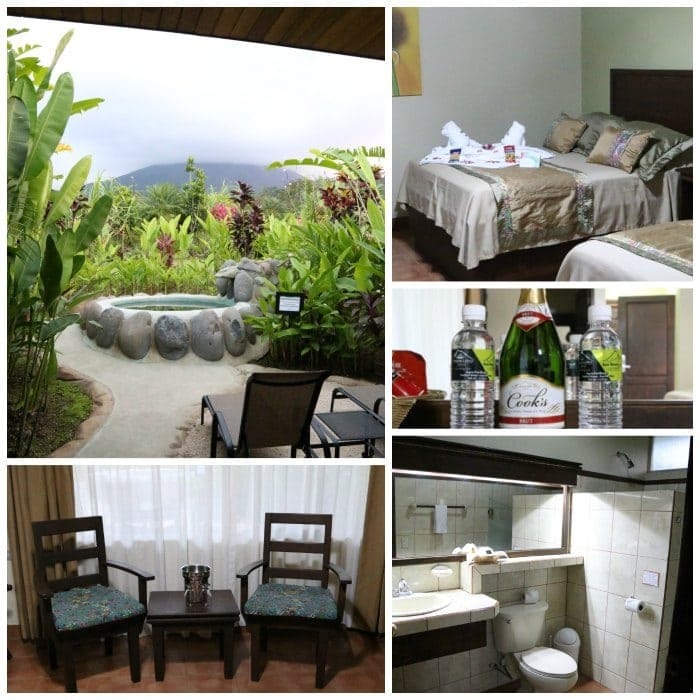 The perfect family hotel near the Arenal Volcano in La Fortuna Costa Rica isVolcano Lodge and Springs! A mid-priced hotel that caters to families- delicious continental breakfast, gorgeous volcano views, multiple hot springs and cold pools and beautifully groomed walking trails. If you are the parent of young children- do not miss Volcano Lodge and Springs. You will relax while your kids have fun- it’s not to be missed on a family visit to the Arenal Volcano area of La Fortuna Costa Rica! On our most recent family trip to Costa Rica, we had the amazing opportunity to travel the country and stay at some amazing family hotels. We spent time in Jaco beach riding horses and eating amazing food, then headed up to Playa San Miguel for four nights at Hotel Cristal Azul, and also spent time at a completely off the grid farm called Rancho Margot. It was our best Costa Rica family travel itinerary yet. It’s no secret, however, that La Fortuna is one of my favorite places in Costa Rica. 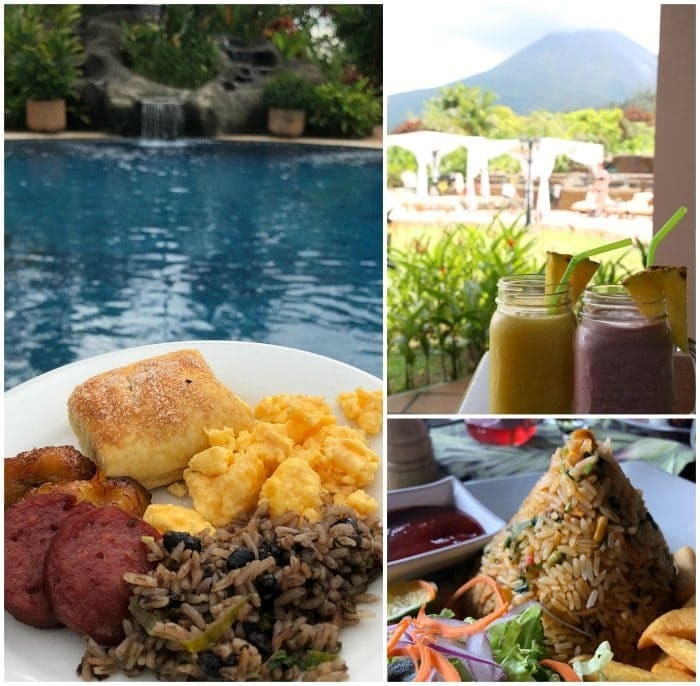 The Arenal Volcano is simply breathtaking every time I see it, and I am always in awe of the awesome food and customer service that are trademarks of the region. We never miss La Fortuna on our Costa Rica trips, but we usually just spend the day there- we eat at on of our favorite restaurants before heading to Kalambu Hot Springs or Eco Termales for the evening. So I was really excited to partner with Volcano Lodge and Spa this trip for a fully hosted stay in one of their Thermal Superior Rooms. We loved the experience, and can’t wait to share the details with you- and offer a special discount for Pura Vida Moms readers! The Volcano Lodge and Springs resort is a fully Costa Rican owned hotel- in fact it is family owned. I loved seeing brothers and sisters working alongside their parents. When we first arrived at the hotel my girls wanted to go to the playground- next to where they were playing the family that owns the kitchen was having a meeting, and the mix of business and family was so fun to watch. The resort is located on the main road leading out of La Fortuna and towards the Arenal Volcano, the laguna and dam, and the town of Tilarán. In short, it’s where most all the hot springs resorts are also located. 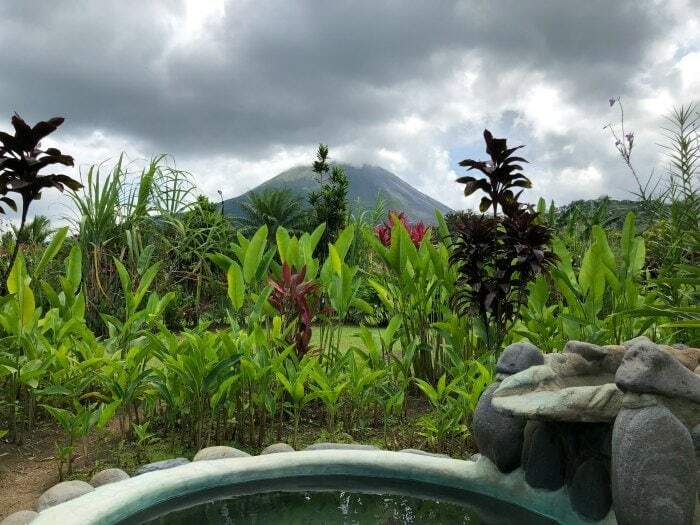 Volcano Lodge and Springs is about 10 minutes from the city center of La Fortuna, and the views of the Arenal Volcano from the property are simply amazing. When you arrive on the property, you will park near the office and reception to check in. Expect to be pampered- our check in was efficient, courteous and friendly- and we all got a delicious natural fruit welcome drink. From the reception, you will be given directions to your room where a bellhop will be waiting to help you unload your suitcases and get situated. We stayed in a Thermal Superior room, which I would highly recommend because it has it’s own mini hot spring pool right in the back! Our room was spacious and impeccable clean- and included a welcome bottle of champagne and snacks! The room had two queen beds, air conditioning and fan, a refrigerator, wireless internet and cable television. The back patio was private and spacious and had an amazing view of the volcano. Plus- there was cable tv for the kids while parents relaxed in the private hot tub! Need I say more? So, as we know, I love Cota Rican food. I love it so so so so so much! And let me tell you- we ate like KINGS at Volcano Resprt and Spa. Every room booking includes a full breakfast buffet in the main resturant, and we also had a packag that included lunch and dinner. There is poolside appetizer and drink service and several wet and dry bars throughout the property as well. Our breakfast had all the traditional Costa Rican foods- gallo pinto, eggs, tortillas, coffee, juice, fruit, plus a waffle bar and panckakes, sauge, cheese, cereal, – bascially anthing you could want! We loved it, and it started early which we were thankful for as our girls were up at 5 am every morning! Lunch and dinner were fixed menus with several options for each of the three courses and a good kids’ meal. We samples shrimp and rice, chicken and rice, filet mignon, roasted pork tenderloin, vegetable soup, and some amazing salads. I especially loved how beautifully and lovingly the food was plated- my chicken and rice was even shaped like a volcano! Service was excellent- we were trated like family in the restuarnat and the waiters and chefs even made accomodations for the food our girls enjoy. I would recommend this restaurant even for non guests- the price it reasonable considering the quper ghigh quality of the food. Can’t wait to go back- AND the kids’ pool is next to the restuarnt. I saw lots of parents eating at the tables next to the pool while their kids swam. There is a lot to do right on the Volcano Lodge property- there are four pools of varying temperatures that are great for kids and adults alike. I loved the Wet Bar pool- it was shallow enough for my kids to play, and there were also fun nooks and crannies into which couples could sneak over and enjoy too. There is also a fun play structure right by the main restaurant- we played there a ton! I enjoyed a cold beer and volcano views while the kids played and made friends with the other kids staying at the hotel- friends from all over the world! I was also super impressed with the grounds- there is an awesome reforestation project with flora that is clearly labeled so it’s easy to walk along and learn about the native plants on a self guided tour. The Volcano Lodge and Springs team can book literally ANY experience you want to have in the La Fortuna area- and they can do bookings even fore just one person. Which is amazing- most of the time in Costa Rica you have to have two or more people on a tour. With Volcano Lodge and Springs, if dad wants to ride an ATV and mom and the kids want to do a zip line you can totally do that. It’s a huge advantage, and their tour prices can’t be beat. Looking for more Costa Rica with young children tips? And guess what?!?! 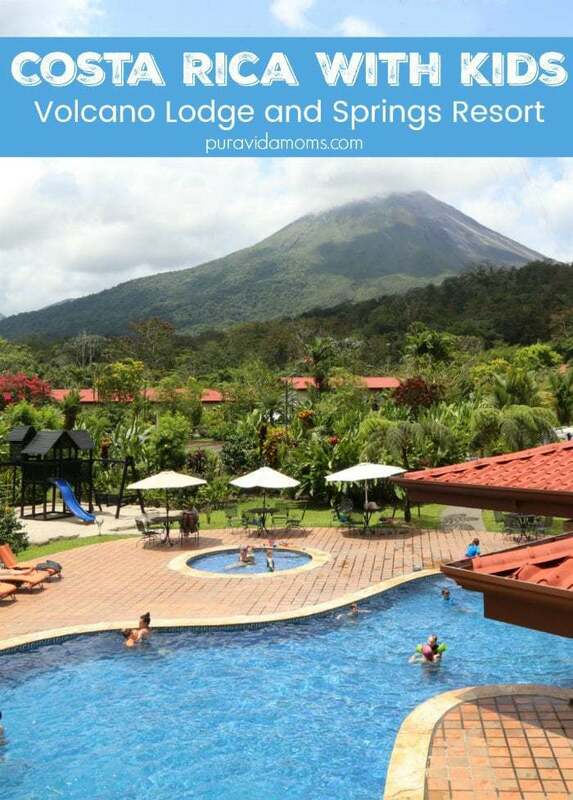 Volcano Lodge and Springs has partnered with Pura Vida Moms to offer a discounted stay for our readers! Simply fill out this form and a representative from Volcano Lodge and Springs will reach out to customize a stay for you and your family! Please note that your information will be used solely for the purpose of connecting you directly to the representative at Volcano Lodge and Springs in charge of discounted stays for Pura Vida Moms readers, and for no other purpose.